A few weeks ago, I was approached by a potential client who wanted to meet because she was downsizing her 3000+ square foot home into a 1000 square foot (give or take) studio / living space. Can we talk about what a move that is?? When she first moved into her spacious home almost 10 years ago, she was thrilled to build what became her closet ROOM. Yes. Room. Not a walk in closet, but a full blown room – which actually didn’t even house ALL her clothing. In our meeting, she recalled how she would be SO overwhelmed by the sheer number of things she owned that she went to uniform dressing: suits on Monday, nonprofit branded items on Tuesday, college branded items on Wednesday, etc. Over the past few years, she recognized that she needed a change – she launched her own event planning business and took a step back from nonprofit work. As she slowly made changes in her professional life, she sought to make changes elsewhere with one of the primary changes being reducing and downsizing her living footprint, which included her closet room. 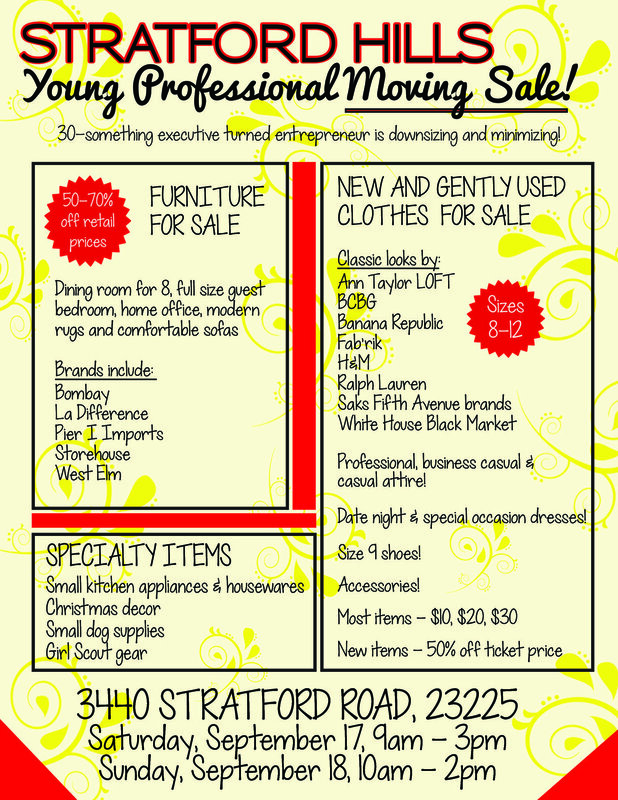 But not only is she cleaning out and getting rid of things, in true event planning fashion, she’s throwing a downsizing sale – furniture and clothing – it must go! I heard her story and my heart just resonated with her – studies show that women will spend nearly a YEAR of their life staring into their closets not knowing what to wear. Women are so overwhelmed with the miss-matched pieces that make up their wardrobes that nearly 1 in 4 pieces are left unworn. I told her I could absolutely help her. The task was daunting to say the least. She had nearly 30 years’ worth of clothing in that room. My client did the first pass of pulling out the pieces she knew she wanted to keep and then we worked together one morning to merchandise her room for the event (merchandise = fashion speak for arranging things on racks, by size, color, etc.). You can see in the photos below, just how big the room was - the clothes left are one she has committed to selling. Together, we turned a room she had previously emptied into a well-organized, event-ready space. My client’s clothing was already organized by color (pro-tip: arrange by color to quickly find things you need), but the first thing I did for this organization task was to separate by type: sleeveless, short sleeves, long sleeves, sweaters, etc. and then by color within those types. This way, folks who are shopping can easily go to the style of item they want, without shifting through other things. We also ended up with sections for skirts, pants, dresses, suits, outwear, shorts, jeans, and shoes. AND we set up a whole $2 table full of basics along with some areas for $1-$3 accessories (think: jewelry, scarves, clutches). This type of downsizing work is completely life changing – cleaning out clothing that no longer serves you welcomes in space for new beginnings, fresh starts, and enjoying simplicity. Being able to see the clothes you own and being armed with the knowledge of how to mix and match all of your pieces brings you wardrobe freedom – you no longer need to waste a year of your life deciding what to wear. Soapbox over. Come to her sale! My client has a lot of great, gently worn, business casual pieces. Details are below. I hope you will attend!